Just discovered these mats/frames from Aaron Brothers in Sacramento. Perfect for my ACEOs (Artists Cards, Editions and Originals). The frames are metal and the colors are just right for my series of tiny watercolor abstracts and fruits oil paintings. I finally finished organizing and sorting through my receipts for tax returns and other business forms to submit. Meanwhile another abstract. I did a series of analogous colors of greens and yellows. Using anything from palette knives to pins, I strived for texture in each piece. Unfortunately there are business forms that are due at the end of this month. So I have spending hours sorting through my receipts for a whole year! Such a headache! New Year’s resolution is to keep up with the art receipts. But Day 27 is an small 4 x 4 abstracts that I had been doing along with the pencil portraits. Hope you enjoy! New series of small watercolor prints for sale on my Fine Art America. Done on 9 3/4 x 4 inch Arches rough watercolor pad. 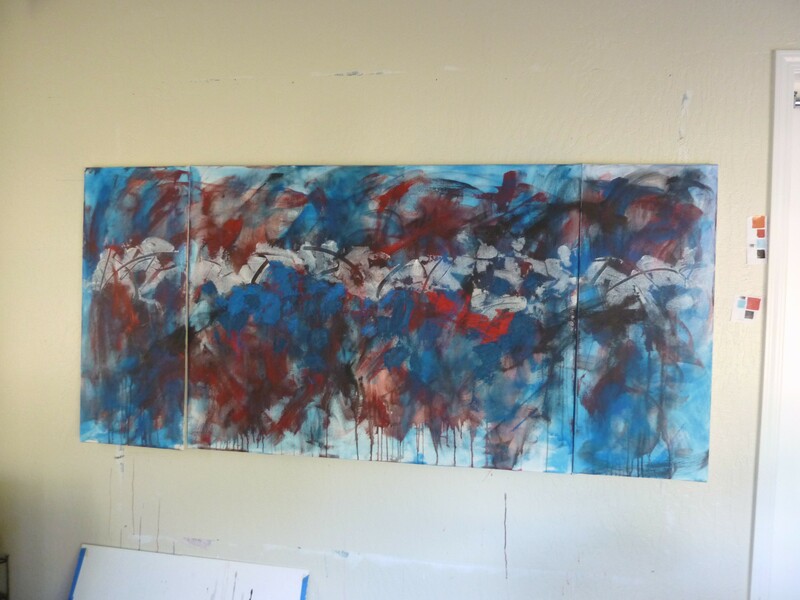 I approached it as a free flowing exercise to create abstract landscape imagery – following the paint as it leads. Originals are for sale so please email me if you are interested at marleneleeart@gmail.com. Will be up on Special Listing. Preparing for an upcoming show in July. 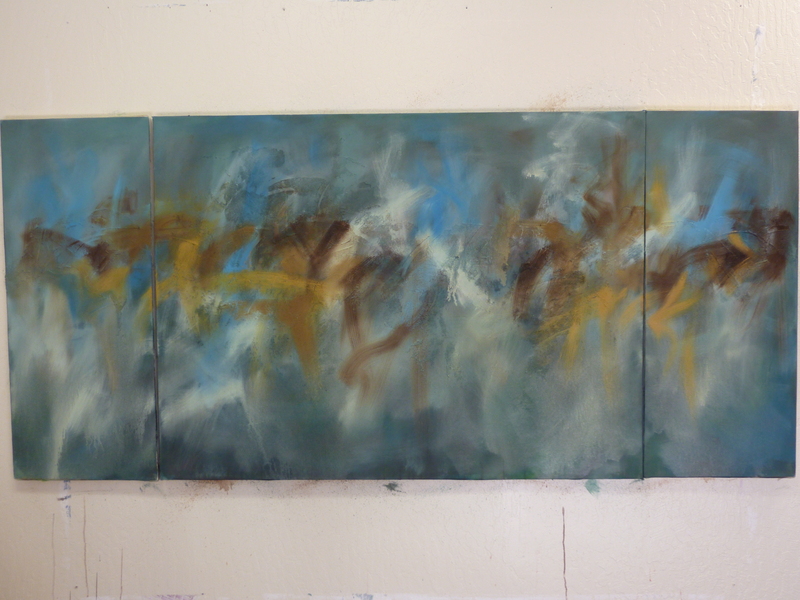 Tritypch Continued . . . .
More colors added – burnt umber. My attempt to is to neutralized the background…tone it down and create more drama around the center. 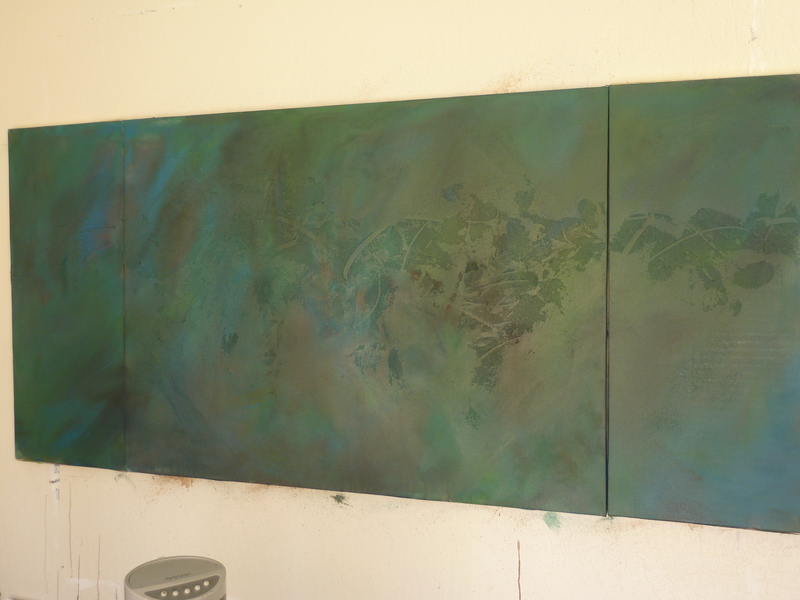 I decided to go back to my triptych painting on the wall after painting portraits for several weeks. It felt good to be able to swing that brush across the canvas. 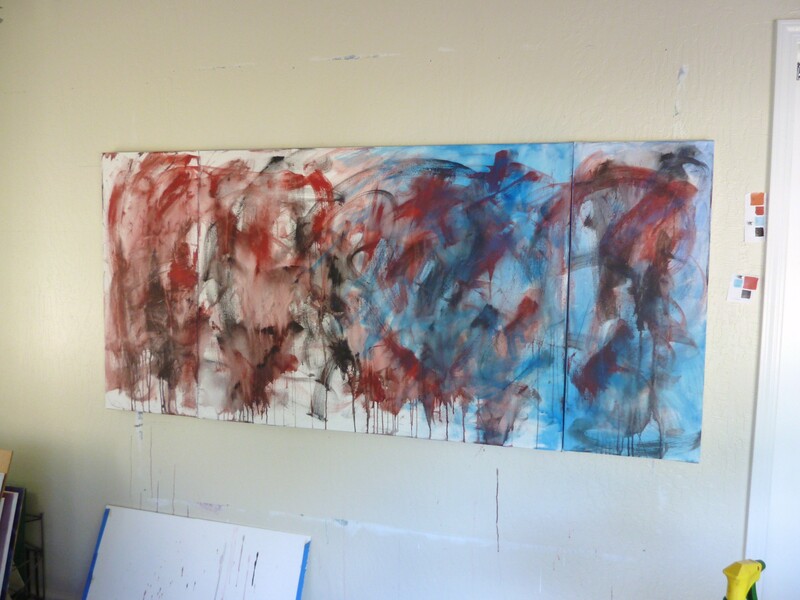 First I covered the muddy colors of red and brown with cerulean blue and cad yellow. From dull to bright. But too bright. The combination of cad yellow and blue gave almost a neon green. 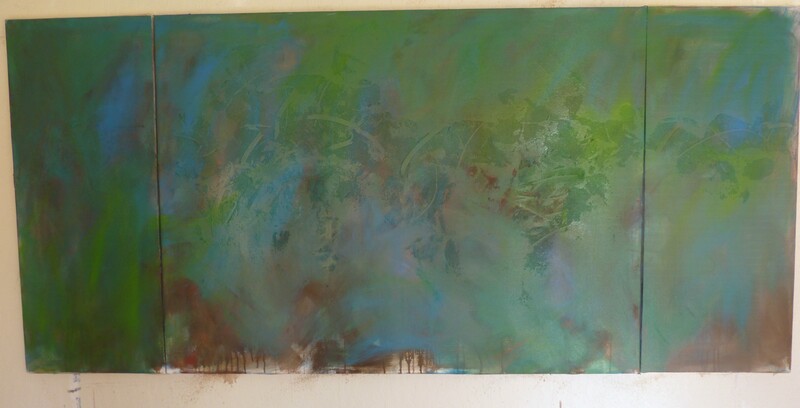 My objective in this abstract was to paint more neutral. So I worked with burnt umber and cerulean blue which definitely toned down the canvas. Now it’s heading in the direction I want. 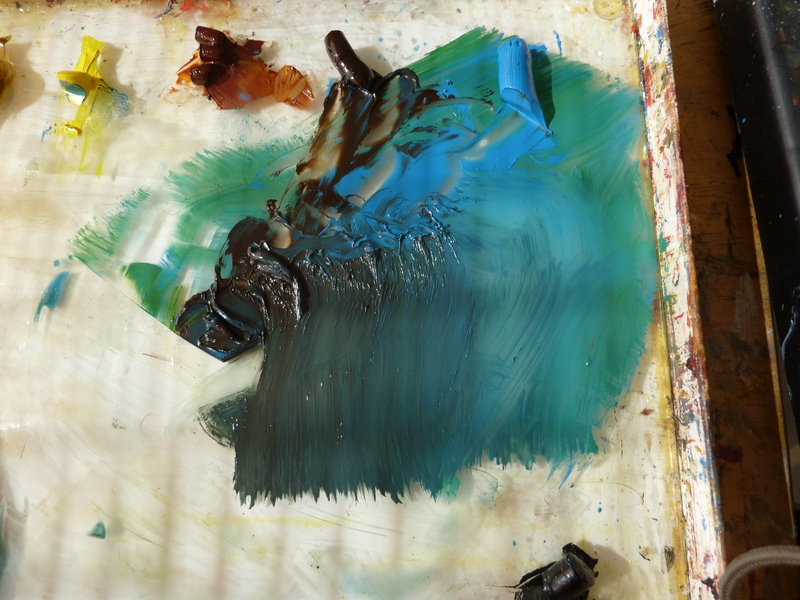 Dealing with 3 main colors: cerulean blue, ivory black and cadmium red. Found these color combination in a home decorating magazine. 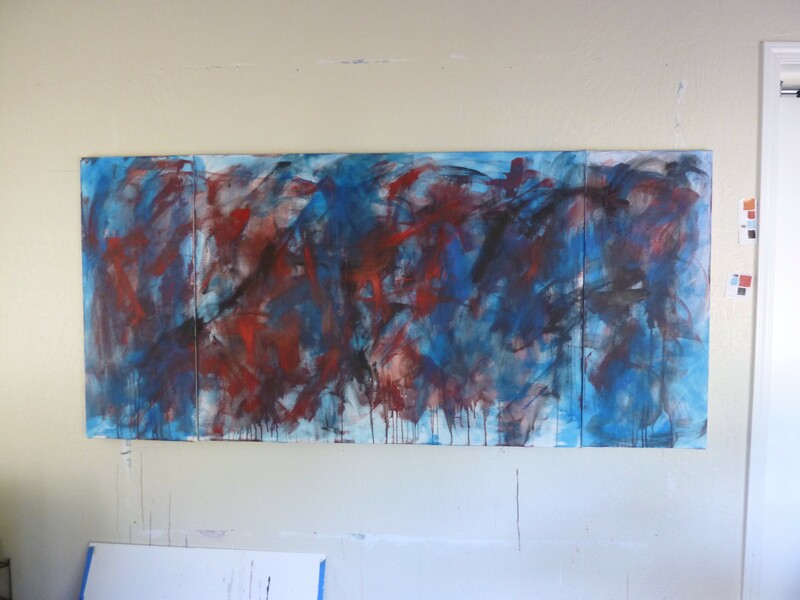 There are 3 panels: 2 18″ x 48″ and 1 48″ x 60″ or about. 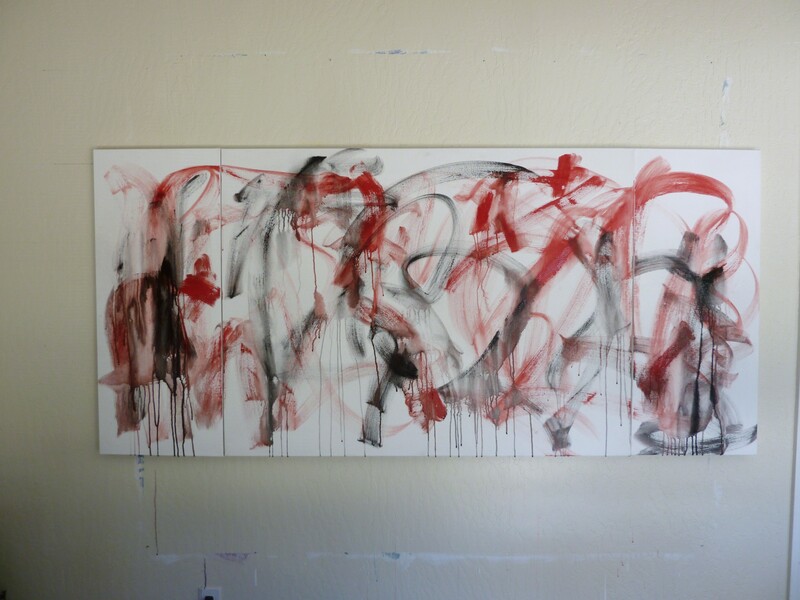 There something freeing about taking a brush and swishing all over the canvas. Everything is done in acrylic first. So I started off with black and red. And then blue came in. Light washes of blue. Using a water sprayer to spread colors more. Accents of thicker came in. Then application of acrylic medium of glass beads and pumice gel. All experimental. Where it goes I have no idea.